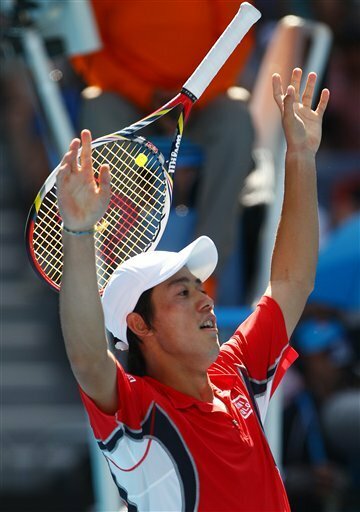 Kei Nishikori caused an upset at the Australian Open as he toppled sixth seed Jo-Wilfried Tsonga in five sets. Monfils downs Rafa to move into the final against Tsonga. Gael Monfils set up an All-French final at the Qatar ExxonMobil Open Friday, defeating World No. 2 Rafael Nadal 6-3, 6-4 in Doha. Monfils will meet countryman Jo-Wilfried Tsonga in Saturday’s title match. “It’s always really tough to play against Jo because he has a powerful game, and kind of game [where] it’s tough to manipulate him from the baseline,” Monfils said. “I need just to focus on my game and focus on my mind. It’s always tougher to be like this in the final against a friend. You want to show him you’re the best, and sometimes, you’re going too fast, and sometimes you’re a bit shaky. You have to find a balance.” Monfils won the first set after converting the lone break point opportunity of the set in the sixth game. Nadal regrouped to begin the second set, taking a 4-1 lead before Monfils picked up his level of play. During one stretch, Monfils hit 19 consecutive first serves in play. He broke Nadal in back-to-back return games to move ahead 5-4, and closed out the one hour and 36 minute victory on his third match point. “I just focused on my game and being aggressive,” said Monfils. “Today everything worked.” With the win, Monfils snapped a five-match losing streak to Nadal; his other win against the 25 year old came in the Doha quarter-finals three years ago. Tsonga advanced to the final after Roger Federer withdrew prior to their match with a back injury. He holds a 2-1 record against Monfils, but his compatriot won their most recent encounter in Montpellier in 2010. Roger Federer will play Jo-Wilfried Tsonga in the final of the Barclays ATP World Tour Finals. Roger Federer will play Jo-Wilfried Tsonga in the final of the Barclays ATP World Tour Finals on Sunday after the Frenchman defeated Tomas Berdych 6-3 7-5. Earlier, defending champion Federer had seen off David Ferrer 7-5 6-3 to move into his 100th career final and to within one win of a record sixth title at the tournament. The defending champion extended his winning streak to 16 matches and made it nine victories in a row at the end-of-season showpiece, while the result means he will retake third place in the rankings from Andy Murray next week. It was not a vintage display from Federer, who was edgy in the first set in particular despite having won all his previous 11 meetings with Ferrer, but once he had secured the crucial break in the 11th game the outcome never seemed in doubt. Tsonga moves into the semifinals with a win over Nadal. Rafael Nadal was knocked out of the Barclays ATP World Tour Finals at the group stage as Jo-Wilfried Tsonga powered his way to a 7-6 (7/2) 4-6 6-3 victory over the world number two at London’s O2 Arena. Nadal’s thrashing at the hands of Roger Federer on Tuesday had put him into a straight shoot-out with Tsonga for the second semi-final place and, although he levelled the match in the second set, there was no denying the Frenchman in the decider. Nadal had taken a month off prior to the tournament with next weekend’s Davis Cup final against Argentina in mind, and he certainly lacked his usual sharpness. Tsonga played a superb match, though, to reach the semi-finals for the first time, and he said: “I just played amazing. It was not easy for me to come here against Rafa but I did it tonight and I’m very happy.” As well as a place in the semi-finals to play for, there was also something to prove for Nadal after his 6-3 6-0 thumping by Federer two nights ago. While the scoreline was largely down to Federer being in a zone even Nadal cannot reach, the Spaniard’s cause was not helped by a lack of penetration on his serve and groundstrokes that has betrayed a lack of confidence at times this season. Tsonga, with his explosive shots and aggressive intent, would provide a real test on the relatively fast surface, some pundits even making him the favourite. And the Frenchman was certainly quick out of the blocks, testing Nadal’s famous defences from the off. It did not take long for them to wobble, Tsonga forcing two break points in the fourth game, but he could not take either. Tsonga beat Nadal most recently at Queen’s this summer, one of only two wins he had managed in eight meetings prior to today, and it was all the world number two could do to keep pace in the early stages here. Roger Federer kicked off the singles action at the Barclays ATP World Tour Finals in London with a 6-2 2-6 6-4 victory over Jo-Wilfried Tsonga. The fourth seed cruised through the opening set at a packed O2 Arena, but Tsonga hit back when Federer’s level dropped in the second and the result looked in doubt until the Swiss star broke to edge a tight decider. The 30-year-old went into the tournament as the man to beat after back-to-back titles in Basle and Paris, where he beat Tsonga in the final to remain unbeaten since the US Open. The Frenchman, playing at the O2 for the first time, could draw on his magnificent Wimbledon victory over Federer this summer, when he became the first man to beat Federer at a grand slam from two sets down. But the world number four had won both their most recent meetings and did not take long to move ahead today, breaking in the fourth game after his opponent had let him off the hook in the previous game with a woeful miss. Tsonga is an exciting but unpredictable player and, as with the opening set in Paris last weekend, he simply made far too many mistakes. Another break to love gave Federer, cheered by French football star Thierry Henry, a fairly uninspiring set in 21 minutes, both men taking their time to adjust to the relatively slow pace of the court. But Tsonga then benefited from a series of Federer errors in the third game of the second set to break. That gave the former Australian Open finalist the lift he needed and he began to play much better, using his brutal power to rush his opponent. His fearsome forehand was becoming a real feature of the match and he used it to great effect to force another break to move 5-2 ahead, before clinching the set when Federer netted a backhand. The 16-time grand slam champion had a real fight on his hands, particularly considering he had never previously won a deciding set against Tsonga. The Frenchman was the first to face a break point in the fifth game, which he saved with a pinpoint forehand, but the outcome remained on a knife-edge. Rafael Nadal, in action later in the other Group B opener against Mardy Fish, arrived courtside for a glimpse of the action, but no sooner had he done so than Tsonga cracked. An easy volley dumped into the net was followed by a double-fault, and when Federer creamed a winner down the line he had three match points, taking the second with a backhand placed neatly behind his opponent. Roger Federer won his first Paris Masters title with a 6-1 7-6 victory in the final against Frenchman Jo-Wilfried Tsonga. The 30-year-old Swiss third seed became only the second player after Andre Agassi to win titles at Roland Garros and Bercy – the two men’s Paris tournaments – thanks to a suberb display over 85 breathtaking minutes. Federer raced to a 4-0 lead and claimed the opening set in 30 minutes against the sixth seed thanks to his sharp first serve and devastating forehand. The Frenchman at least made a contest of the second set, threatening to break on two occasions, but it eventually went to a tiebreak which Federer won 7-3 after racing into a 4-0 lead. It was Federer’s third ATP title of the year after tournament wins in Doha and his home town of Basel last week. It was also his 18th Masters title, second only to Rafael Nadal who has one more to his name. Tsonga had two break points in the first game but Federer held him off with two first-serve winners. The Swiss moved 4-0 up after a Tsonga return went wide and a double fault earned him a double break, as a frustrated Tsonga struggled for ideas in front of vociferous support from the majority of a 14,500 crowd. Tsonga had a flicker of a chance in the second set, earning a break point in the fourth game with a sizzling crosscourt passing shot, but blew his opportunity by sending a forehand wide. Tsonga faced a break point in the 10th game but staved it off at the net and the contest went into a tiebreak which Federer won comfortably. Federer will head to the ATP Tour Finals in London next week on a 12-match winning streak, after claiming his 69th career title from 99 finals. The battle for the Barclays ATP World Tour Finals last three spots. With three spots still up for grabs in the chase to the Barclays ATP World Tour Finals, the fate of several players’ year-end championships hopes will come down to their performances this week. No. 6 Tomas Berdych, No. 7 Jo-Wilfried Tsonga, and No. 8 Mardy Fish all control their own destiny – reach the final and they’re guaranteed a berth to London. Nicolas Almagro (9th) and Janko Tipsarevic (11th) each need to make the final to have a shot at qualifying. Frenchmen Gilles Simon (12th) and Gael Monfils (14th) have to win the title to keep their hopes alive. Tsonga defeats del Potro in Vienna and helps his chances of qualifying for London.